It was a surreal break from the safe sameness of the suburbs. Cell phone video shows Las Vegas police officers chasing suspects in a car through a Henderson park as kids practicing soccer and their parents watch it all go down. 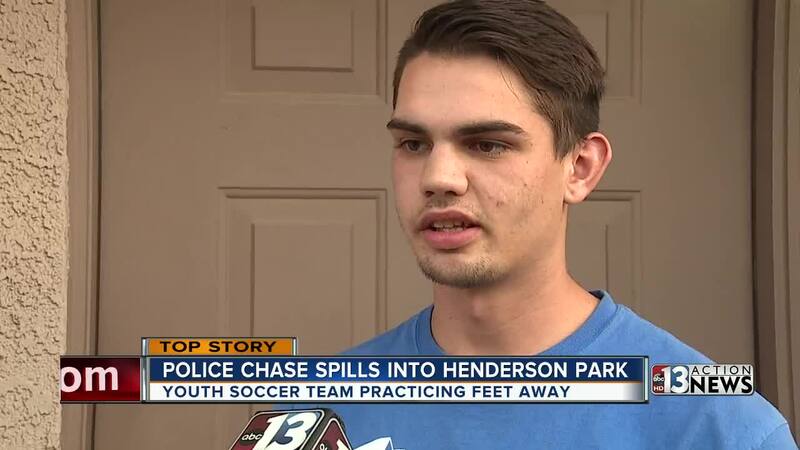 "It's just a normal Thursday night at a soccer practice where random stuff happens," said Bryen Estes who was at Cactus Wren Park Thursday night for his brother's practice. "Out of nowhere we just heard helicopters flying over, " said Estes. Estes recorded the incident and then posted it on Facebook where you can clearly see kids on the soccer field. "I was like what is happening," Estes said. According to Las Vegas Metro Police, two armed suspects carjacked the vehicle from a delivery driver. The chase ended when the driver crashed into a fence at the park. What you don't see in the video are the suspects running away. 13 Action News showed the video to parents at the park Friday evening where dozens of kids were practicing again and parents like Mike Rios were watching. "It's insane! People are crazy! The kids are practicing right there and everyone got out the way," said Rios. "Luckily no one got hurt." Some parents said they were concerned, but believed it was just a rare freak occurrence. "You'd never expect something like that to happen especially in a neighborhood like this," Rios said.